George Washington's History is so much a part of the history of the United States of America, that without it America would not exist as it does today. Was he a perfect man without flaws? No, but for the times that he lived his accomplishments effected the creation of possibly the greatest nation in the world. To learn even a little about such a life can only help us with our own. 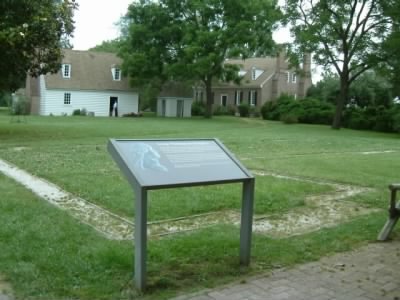 George Washington's birth took place on Pope's Creek in Westmoreland County, Virginia, on February 22, 1732. His father was Augustine Washington and his mother was Mary Ball, Augustine's second wife. George had two older half brothers from his father's first marriage, Lawrence and Augustine Jr. Lawrence would have a huge influence in his younger brother George's future life. George also had five younger siblings from his father and mother's union. There is not a lot of reliable information about George Washington's youth but I would guess that he was not an extrovert based on his later years. He would have to have been a thoughtful and then deliberate young man. We know that when he was eleven his father died leaving the majority of his holdings to George's older half brothers. His mother had enough to maintain her family, but George would not go abroad to school. In fact he went to local schools until he was 15. He didn't learn a foreign language as many of the upper class youth did and he never did attend college. He considered his education severely lacking which drove him to reading and self study. From all indications George was adept at mathematics which showed a left brain mentality. That would make George more of a logical thinker. That would serve him well later on in life both as a military strategist and farmer. George was involved in slavery from the time he was born. Another wards he grew up with it and when he was 11 he inherited 10 slaves and 500 acres of land. Slavery in the minds of citizens today, rightfully so, is a horrendous thing. We believe that the ownership of another human being is a terrible travesty of justice. However, back in the 1700's it was common practice. It was and will never be a correct principle and there were plenty of people back in those days that disagreed with the practice. Most of them were not farmers depending on the labor. We will discuss this issue of George Washington as a slave owner later on in the page. There are numerous stories of George Washington, his honesty, integrity and strength. Some could very well be true but there is no good way to verify these stories as fact. I will say that from the facts that we have concerning his later years he had to have been an extraordinary young man. Looking for more information about George Washington's History?